The Emergency and Trauma Care supported by 24 clinical departments and diagnostics services ensures that all critical cases are given immediate and adequate care. There are 32 critical care beds with staff trained specifically for intensive care and round the clock anaesthetists. 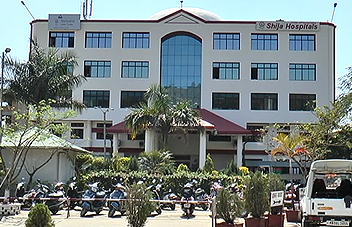 Shija Hospitals launched the first Private Ambulance Service on 1st January 2000 in Manipur. Recently, Shija launched another full-fledged ambulance service called “ Shija Manipur Ambulance Service” to serve the people of Manipur and its neighboring states by providing ambulance service similar to 108 National Ambulance Service in collaboration with ZHL( Ziqitza Health Care Limited). The Ambulances are equipped with GPS tracking system to identify its spot and to access the nearest Ambulance for immediate attention. Shija Manipur Ambulance Service is managed and operated by Ziqitza Health Care Limited (ZHL) with expertise support from Shija Hospitals to serve the people in their Golden Hour. The Ambulance Service is available for emergency care services throughout Manipur to assist & transport patients at faster response time.